Today I want to share a treat with those of you who are learning the Irish language or considering it! I get emails and messages from people often asking for my advice on how they should get started on Irish and what my opinion is on the best resources to use. Although there are a decent amount of books and online resources available for Gaeilge compared to most other minority languages (if you look hard enough), it still can be a bit of a challenge for newcomers to find the most suitable material – especially if they’ve got their heart set on a particular dialect. While it is certainly possible to learn Irish using free material, if you’re serious about learning the language then a few small monetary sacrifices go a long way. In the past I recommended resources like Turas Teanga and An Ghaeilge Bheo which I still believe are two of the most useful things you could use for learning Irish (they’ve helped me a lot) but today I want to share something which I believe is superior to all of the others. It’s a self-learning resource that I didn’t discover until quite late in my Irish mission and I was kicking myself for not knowing about it earlier. 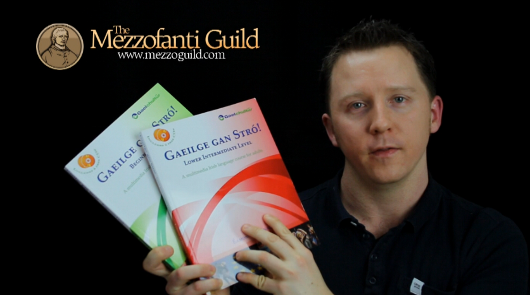 The book series is suitably named Gaeilge Gan Stró (Irish Without Hassle) and it’s available as both a book and an online course (the online course is at Ranganna.com). While there are some minor differences in what they both include, they both contain essentially the same content and structure. The good people over at Gaelchultúr were kind enough to let me try out their online course as well as some review copies of their Beginner and Lower-Intermediate books so today I’m going to show you why it’s such a great resource for anyone learning Irish. Ranganna and the Gaeilge Gan Stró book series were put together by Gaelchultúr, which is an organization that exists to promote the Irish language and culture in Ireland and internationally. The first impression I got while checking out their books was that Gaelchultúr’s passion for the Irish language is really reflected in their high quality material. This is important when selecting materials for any language as a lot of resources are put out by large companies that put profits first and learning second – it’s clear that promoting the Irish language is Gaelchultúr’s priority and passion. For those of you who are in Ireland, they hold classes around the country for various proficiency levels which you can find more about here. There are also online classes available up to Lower Intermediate level (I wish I had known about this last year!). The online classes work out to be €18 per session (a package of €180 for 10 lessons) which is actually very reasonable. I was paying €30 per lesson last year for Irish lessons elsewhere via Skype which seems to be a standard rate for most teachers, so the lessons at Gaelchultúr are inexpensive by comparison. 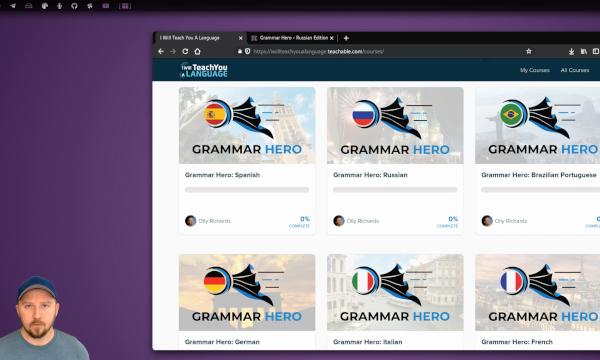 I’ve had the opportunity to use the Beginner and Lower Intermediate books over the last few months (there is a higher level one as well for grammar called Gramadach Gan Stró which I haven’t seen yet). The beginner book is aimed “at those who have not previously studied Irish” and the intermediate one “at those who have already learned Irish and still understand some of the language”. For those of you who did years of Irish in school, the intermediate book would probably be the right place to start. I’ve actually found the beginner book useful though even being at an intermediate level myself as it covers quite a lot of vocabulary and expressions which I hadn’t covered before. For those of you who are completely new to Irish, the beginner book will get you speaking straight away with relevant, useful conversation and it offers very clear explanations where other products don’t. The beautiful thing about this series is that it doesn’t focus on grammar. This is where Irish language education has failed miserably in my opinion and one of the main reasons why so many Irish people aren’t able to communicate in Irish (or are turned off the language completely). That’s not to say that Gaeilge Gan Stró doesn’t teach grammar though – it just teaches it through context and only gives just enough information to get you using it without needlessly overwhelming you. This is a huge feature of this book series. When I first discovered Gaeilge Gan Stró, I was at An Siopa Leabhar in Dublin looking to buy another book series that I’d heard great reviews about. The problem was that this particular book series focused on the Ulster dialect and I really wanted something with a broad focus. The guys at An Siopa Leabhar recommended Gaeilge Gan Stró as it not only has superior content, but the dialogues cover all three dialects – Munster, Connemara and Ulster. The conversation sections in Gaeilge Gan Stró don’t differentiate between the dialects however as you might expect (no attention is drawn to the dialects being used) – conversations take place between speakers of different dialects so you have plenty of exposure to the different ways things are pronounced. As I’ve written before, dialect difference in Irish is a minor issue compared to a lot of other languages but it’s a good idea to get exposed to them all early on, as you will with this resource. One important point that I missed in the video is that the Frásaí Úsáideachá (useful phrases) and Stór Focal (vocabulary) sections of the book don’t come with audio but the online course does. This is a big enough incentive to use the online course as there are quite a lot of useful phrases and essential vocabulary in the book and it’s very handy to be able to listen to their pronunciation. For those who are only using the book, this is a frustrating thing to have been left out. I also didn’t mention in the video that the Talking Heads audio is actually included with the book but the video is not. For visual learners like myself, the video is incredibly useful and I would have liked to see more of this throughout the course as there is a real lack of quality video resources for Irish. The Ranganna.com course comes with access to a student forum too where you are able to post questions for fluent Irish speakers and engage with other Irish learners as an added bonus. If you’re serious about learning Irish and want a copy of Gaeilge Gan Stró, then you can get hold of it through Amazon. It's lovely to see a review of this series Donovan. I second your sentiments. I've taken at Gaelchultúr both online and on the premises and cannot recommend them highly enough, in terms of passion and encouragement. The audio provided on the volumes above and on the ranganna.com courses is second to none – I've realised my school pronunication was way off-key. Finally I feel I've cracked the Uladh dialect somewhat as well. I use "Gramadach gan Stró", also a wonderful and accessible reference and training book, for when writing becomes an issue.